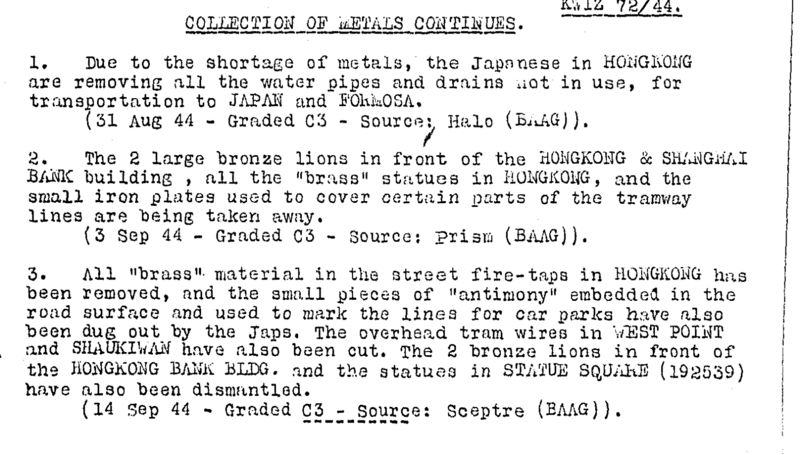 Elizabeth Ride has sent a number of British Army Aid Group (BAAG) reports regarding Japanese efforts to collect metals, vehicles, machinery, coins etc for export, mainly to Japan, during their occupation of Hong Kong (WW2). Elizabeth has re-typed several of these reports and has kindly added references to assist searching where this has not been done. This was a considerable effort on Elizabeth’s part to search for and put in order a number of BAAG reports. I would like to record my grateful thanks to her for this and many other contributions she has made to our website. As she says the material is often somewhat raw but of great value to those researching both the Japanese occupation in general and elements of HK’s industrial history during WW2. Here is Part Two which takes us up to March 1945. 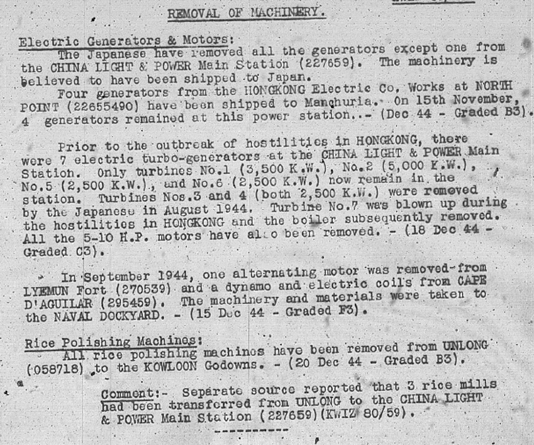 HF: Where relevant individual reports have been included in our three Hong Kong Industry during World War Two articles, linked below. KWIZ #68, 29.9.44 Fire engines. KWIZ #70, 13.10.44. Machinery, Hong Kong Steam Laundry, HSBC bronze lions. KWIZ #72, 27.10.44 pipes and drains, HSBC bronze lions, brass, antimony, tram wires electric cable. KWIZ #76, 24.11.44. (10/23/43) Tramway generators. KWIZ #77, 15.12.44. Materials from Hongkong Oxygen Factory, materials from South China Iron works (not to Japan). Taikoo Sugar Refinery. The Japanese are dismantling the machinery of the Taikoo Sugar Refinery, 700 Chinese labourers being employed daily on the job. They have already cleared the Refining House and the top three stories of the Pan House, together with eleven boilers from the Boiler Room, 3 donkey boiler pumps, and one 5,000 kw and two 2,500 kw generators from the Power Station which formerly supplied power to the Taikoo Dockyard. This machinery is now stored in a godown on the East side of the compound as well as on the Taikoo Wharf, awaiting shipment. China Light Power Station. Four out of the seven generators in the China Light & Power Main Station have been removed, and in addition all 5 and 10 hp motors. Present stocks held in the Green Island Cement Works (221571) are four thousand 100-lb paper bags of cement. 150 workers are employed at varying times, and there now 2 grinding machines in use. 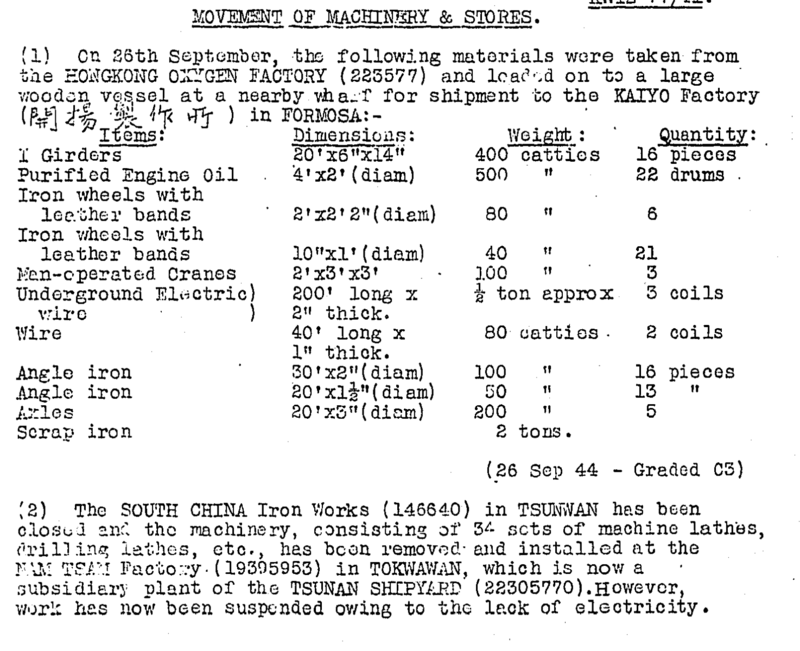 According to a foreman, part of the machinery was shipped to java in October 1943. – (23 Dec 44 – Graded B2 (excl. last sentence). Collection of metals. 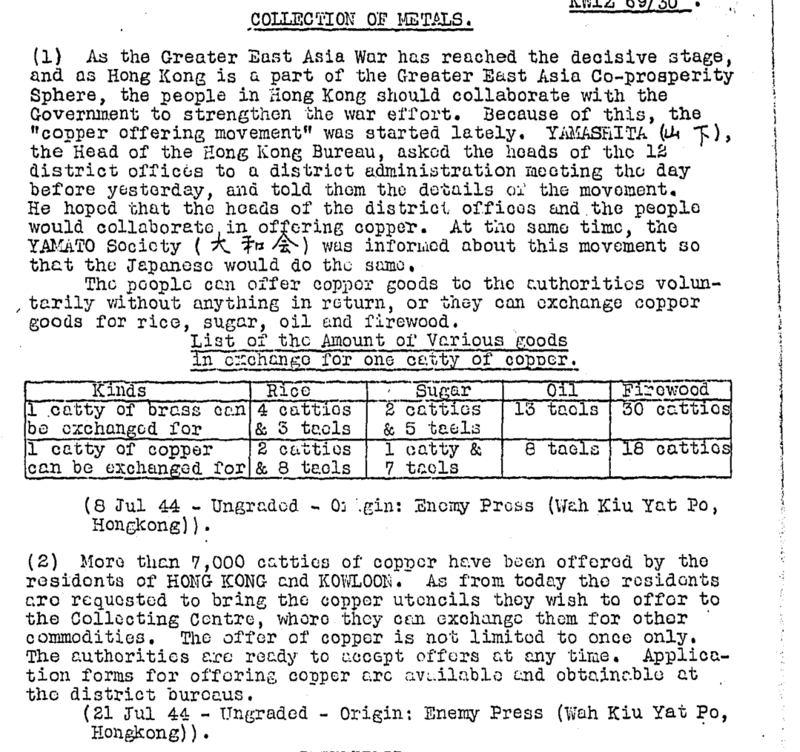 In mid-December 1944, the Japanese circulated forms to all residences in Hongkong and Kowloon requesting recipients to state whether they were in possession of any copper, brass or aluminium. KWIz was ordered to stand down by 1st March 1945. This article was first posted on 10th July 2015. The Index contains many articles using BAAG reports from WW2. And about industry in HK during that time.